We accept new or used bicycles to be fixed and available to those who need one for transportation, health, and fun. Serving the greater Golden area, we also teach bicycle repair and maintenance, promote bicycle safety, and recycle bikes. We provide bicycles to students, families, kids, and anyone who needs a bicycle. We maintain a bicycle repair shop, volunteers fix the bikes, and parts and supplies are purchased with funds from our bicycle sales and other donations. Since the program’s inception, more than 7,000 bikes have been repaired and donated to those in need. The bike donation program, started by member and long-time Golden resident Ted Rains more than 25 years ago, is unique to the Golden Optimists. The program solicits donations of used bicycles from the community and local law enforcement. Volunteers refurbish the bikes and provide them to people who use them for transportation, fitness and fun. We offer helmets at no cost. The Golden Optimists Bicycle Recycle Program is a 501 (c) (3) not-for-profit organization. Our customers include people who are struggling to make ends meet; students, and veterans who need bicycles for transportation; kids who’ve outgrown their bicycles; and others. Those who can afford a bike asked to pay a reasonable amount. Prices for regular bikes can be waived if necessary. This income sustains our operational cost and allows us to buy parts, tools, pay rent and insurance. 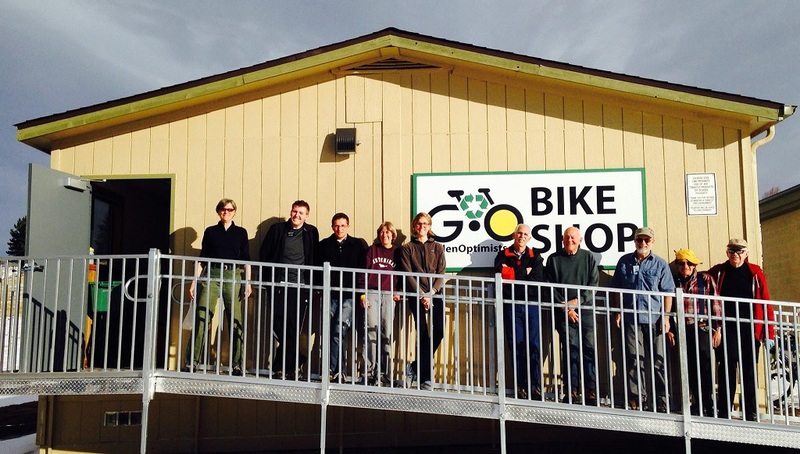 We donate repaired bicycles at an Arvada mobile home, to youth working with Groundwork Denver, Kendallvue Elementary School and Christmas programs run by the Calgary Church and Christian Action Guild. In 2018, we delivered 29 repaired bicycles to the Navajo Nation in Arizona. We remained on the reservation for a couple of days to repair bicycles for local people. We plan to make a similar trips when we can. Most of the bicycles that come into the program are used, unwanted and/or in disrepair. Our program provides an outlet for re-use and recycling. SOURCES OF BIKES: The sources of bicycles in 2018 were the City of Golden and Arvada Police departments, Golden Pride Days, City of Arvada community bicycle recycle event, Colorado School of Mines, various bike shops, and the Jefferson County Sheriff. Our number one source of bicycles in 2018 was individuals donations. Some are broken, some are in good condition (even almost new), and some are trade-ins as kids grow. Community support thorough these donations is amazing. We accept gently used bikes of all types for both kids and adults that we’ll recycle and get back on the road! Please drop them off at our shop at 1200 Johnson Rd., Golden, CO, between 1 and 5 p.m. on Tuesday andThursday. Bikes are at the shop to be repaired The Golden Optimists maintain a bike shop, volunteers fix the bikes, and parts and supplies are purchased with bicycle sales and other donations. …and donated to those who want one. A bicycle is available to any customer who wants a bicycle. We ask for a donation if you are able. There is no required donation of time or money.